Active Stock Traders! See How to Trade Strong Breakouts & Pivots… NEW Course (Filmed January 2018) Reveals How! 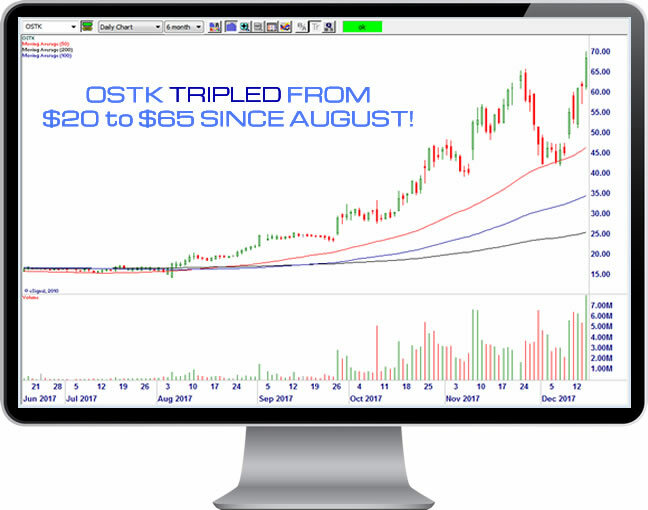 Note this training is all about regular stocks (like OSTK, SQ & RIOT) that are moving due to cryptocurrency volatility, Not about trading bitcoin or other cryptocurrencies directly (too risky in my opinion). YES! Order Your Bitcoins Bonanza Downloadable Video Course Today! 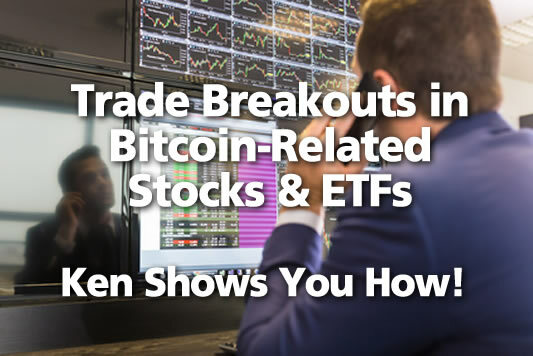 Who Else Wants to Unlock NEW 2018 Trading Strategies for NYSE/NASDAQ Stocks That Are Skyrocketing Up with Bitcoin? Traders who post comments were invited to participate in a brief free preview webinar 12/28/2017 on bitcoin-related stock swing trading. Thank you; it’s great to see your questions & comments — nice teamwork! “Wondering how real bitcoin value will be in the future.” – John M.
“would these stocks be for swing trades or more of a long term buy and hold?” – Bill H.
“Crypto stocks is the latest rage. Will it last? Ken Calhoun can give us the information we require…” – Mura M.
“With the high volatility, would you use a larger target and stop?” – Tracee O. “is the bitcoin market liquid enough to trade?” – Ed M.
“As gov thinks bitcoin provides too much anonymity, are investors in danger of gov edict issued any day to outlaw it, and instead require the use of some other gov created digital currency with zero anonymity?” – Andrew N.
“…looking forward to your session” – Rod E.
“Are the stocks related to bitcoin more volatile than those we normally cover in the live room ? If yes are we looking to trade these stocks with a different strategy ?” – Richard T.
“With the popularity of Bitcoin and now recognized by wall st. , what is your view of the future of Bitcoin?” – Frenchie B. “Bitcoin gone bananas … catch the drift with Ken!” – Stephen C.
“While the ability to trade Bit-coin related stocks sounds interesting in itself, I believe it is important to understand all things that may influence all markets going forward. Currencies (or anything the markets might view as currencies) cannot be ignored.” – James C.
“Made a bundle on RIOT. Now want to know more crypto/ blockchain investments” – James P.
Looking forward to learning how these Bitcoin-related stocks move relative to crypto.” – Joan D.
“How is the crypto market different technically from the forex and stock markets?” – Shawn T.
“It’s certainly interesting to see the development of crypto related stocks. I love the angle of just watching the movement and trading off of that. All trading is psychological, few traders are professional. So I guess, the moral of the story is we know whom will win long term. Anyhow, looking forward to your insights on this” – Tre G.
“always ready to learn new things I am 70 years old and have difficulties to understand this new currency” – Lou B. “How safe is Crypto Currency?” – Kris T.
“with all the unknowns and political intrigue concerning bitcoin, its gratifying that you are going to teach the safest way to invest. thanks again for being here for us!” – Phil F.
“Bitcoin is the new rage. Not all Bitcoin related stocks are created equal. Would be nice to have some simple guidelines to follow. ” – Mura M.
“Thank you so much! Still trying to figure out what is going on with BitCoin and cryptos…. By the time that I got my accounts set up and was ready to go, the train had really left the station! Now looking for another convincing pull back and bottom. Can’t wait to hear your analysis on Thursday! Keep up your amazing work!” – Ned K.
“Dear Ken, I’m looking forward hearing more about bitcoin ETFs. Kind regards” – Marjan M.
“How will SEC regulation of bitcoin affect bitcoins?” – Robert P.
“This sounds like a much safer way to trade Bitcoin! Looking forward to seeing the webinar.” – Debbie N.
“There’s an absolute grounded approach in this educator, as Ken and most others have to keep working to improve their skills; therefore, highly recommend his ideas which make sense for real traders.” – Juan S.
“what is a good way to profitably manage volatility and unfavorable ETF gap moves?” – Paul R.
“Inquisitive about the potential in trading Bitcoin and/or related stocks/ETF” – Larry D.
“Looking forward to learning more about CryptoCurrencies.” – Al M.
Ken replies: Thanks … this training is all about regular stocks & ETFs that are moving due to cryptocurrency volatility. Mostly NYSE/NASDAQ stock swing trading. “What is your estimate for how long this bitcoin string is going to last?” – Barry S.
“There are so many crypto currencies. How do we determine which are legitimate?” – Anupam S.
Ken replies: I assume they’re all too speculative and so I avoid them all. What we’re interested in is regular stocks like SQ & OSTK that trade on the NYSE/NASDAQ that move regardless of individual bitcoins/cryptos. “It would be interesting to see how bitcoin-related stocks correlate with bitcoin itself along with whether performance is leading or lagging… I was taken back by… claiming that bitcoin has “increasingly garnered public acceptance as a store of value”. The self declared sceptics …are now the main beneficiaries of the futures trading … have applying to list bitcoin binary options (a potent mix) – this has legs!” – Don M.
Ken replies: interesting point, thanks! “Bitcoin has exploded. Is it another bubble? We need more information.” – Dave S.
THE FASTEST, SMARTEST WAY YOU CAN POTENTIALLY CAPITALIZE ON BITCOIN MANIA! If you’re like a lot of traders I help, you’re aware that bitcoin & other cryptocurrenies have been making spectacular gains, but you’re not profiting from it…. yet. I haven’t seen anything like it since my early days trading the 1999 NASDAQ bubble — it’s like the classic Dutch ‘tulip mania’ on an unprecedented worldwide scale. But I do NOT want to trade Bitcoin (or any cryptocurrency) directly — because it’s too expensive (see this chart or this one), risky and unregulated for my style. Instead, I DO want to trade NYSE & NASDAQ stocks and ETFs that benefit from bitcoin’s amazing run up (like merchants who accept bitcoin) including: OSTK SQ GBTC and others you’ll be learning about. In my new ‘Bitcoins Bonanza’ training you’ll discover exactly how to day and swing trade volatile charts that are moving due to speculative interest in bitcoin’s astonishing price action. With the recent CBOE futures debut, it legitimizes crypotocurrencies in the eyes of many of Wall Street’s biggest players, so we’ll surely continue to see renewed tradable volatility ahead. You can even copy this .wmv to your tablet or cell phone/mobile device/kindle or watch on your pc. You get a FULL 1 hour, 36 minutes (runtime = 96 minutes) of high resolution downloadable video you’ll learn from… a super value.